(AA-P 175) BMW ✓ ✓ ✓ ✓ † † ? DIN 50 017-KFW Germany ✓ ✓ ✓ ✓ † † ? ISO 6270-2 (AHT) Europe ✓ ✓ ✓ ✓ † † ? VDA 621-421 (Constant Climate) Germany ✓ ✓ ✓ ✓ ✓ ✓ † † ? AS 2331 M 3.13 Cycle A Australia ✓ ✓ ✓ ✓ ✓ ? AS 2331 M 3.13 Cycle B Australia ✓ ✓ ✓ ✓ ✓ ? ISO11997-Cycle B Europe ✓ ✓ ✓ ✓ † † ? VDA 621-415 Germany Automotive ✓ ✓ ✓ ✓ † † ? ✓ Chamber with any optional accessories indicated, can fully comply with all requirements of this test standard. ✓ Chamber with any optional accessories indicated, can fully comply with the salt spray requirements of this test standard, but a separate controlled humidity test chamber may be required to fully comply with all parts of this test standard. ✓ Chamber with any optional accessories indicated, can fully comply with the salt spray requirements of this test standard, but a separate combined condensation/UV test chamber will be required to fully comply with all parts of this test standard. ✓ For the MIL-STD-810G test standard, the test samples need to be dried periodically at "standard ambient temperatures and a relative humidity of less than 50% for 24 hours, or as otherwise specified". This would require either the chamber to be opened to atmosphere in a room controlled to these conditions, or the test samples to be remove to a separate climate controlled test chamber, for this period of time. 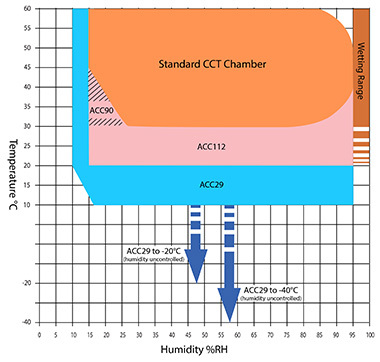 The testing requires the chamber temperature to be maintained below +30°C/86°F but no lower than +20°C/68°F and the chamber relative humidity to be controlled in the range 15-75%RH, between these temperatures. The testing requires the chamber temperature to be maintained below +20°C/68°F. Two versions are offered with a minimum temperature range of –20°C/–4°F and –40°C/–40°F respectively, with or without chamber humidity control down to 10%RH at temperatures down to +10°C/+50°F. o Either one of these two optional accessories may suffice — refer to test standard for further guidance. * This optional accessory is only required for CCT chambers if water spray humidity and salt spray are both required to occur (at different times) during a single test program. # Only required for Alpha + cabinets.
? ACC39 can be used instead of an ACC112 & ACC112/INT if the conditions are controlled at ambient in the lab.